Brenda Courville "BrendaC" born and raised in Henderson, La; where the beautiful Atchafalaya Basin lays. I rent a houseboat and spend weekends out in the basin. I enjoy the view of the birds, big cypress trees, alligators and the sun setting on the beautiful waters of the basin. It's so beautiful and peaceful. I also enjoy traveling the levee and stopping at some of the boat landings like McGee's. They have a nice porch in the back where you can sit and listen and get a great view of the wilderness, like watching the birds in the beautiful cypress trees and see the fish jumping in the water. Every year since a child; me and my family spent Easter on the levee. So many great memories out there. I was pleased when asked to perform at the Atchafalaya Basin Festival. BrendaC developed a love for music at a young age with the organ; given to her by her parents for a Christmas gift. However, it wasn't until she met and befriended the very talented family of Damon Troy in the 90's that she became interested and began playing the accordion. In 2007, BrendaC recorded her first CD with BrendaC and the CajunJammers entitled "Crossover". The title depicts her unique style of music mixing a variety of genres with an added taste of Cajun and Zydeco flavor. BrendaC's CD was a success largely due to Paul Marx and the staff at KBON 101.1 FM when they featured the CD and continued to play her music on a regular basis. 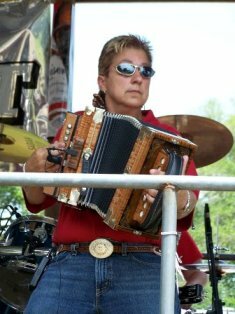 Some of the places BrendaC and the CajunJammers performed on stage are: Pats Atchafalaya Club in Henderson; The Reddog Saloon in Egan; Atchafalaya Basin Festival in Henderson; Arties Sports Bar in Grand Isle; Parks Cracklin Cookoff Festival in Parks; Shannon's in Lafayette; Wranglers in Carencro; Rainbow Rose in Cade; O'Darbys in Carencro; Peggy's in Cecilia; Ricochet's in St Martinville; Lakeview in Eunice; and Park International for the Emma Grace Fundraiser. BrendaC also donates her time performing for benefits. She has performed before and after some of the best bands including : Geno Delafonse; Jamie Bergeron; Damon Troy; Kevin Naquin; etc. She has also performed right before Hunter Hayes for the 2009 Atchafalaya Basin Festival. BrendaC is currently in the recording studio working on a new CD with some new music. If you've ever seen BrendaC perform live; you know she keeps the crowd going with her energy and entertainment. BrendaC is a member of the CAJUN LADY MUSEUM "WALL OF FAME". She now has a video on YouTube (please explain by Wayne Toups) and is in the process of adding more.